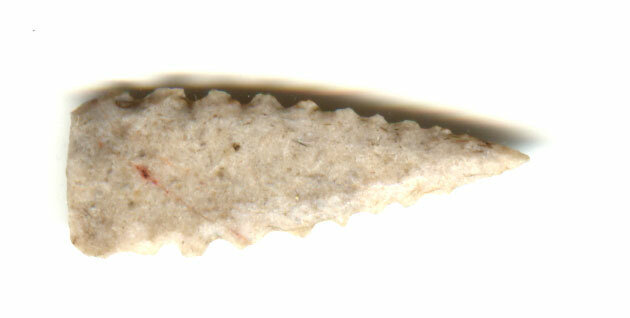 A Large, Thin For The Size, Well Made Fresno Arrowpoint That Exhibits Surface Sheen And Stone Aging Coloration Patination, Correct Straight Base And Serrated Edges, Overall Aged Surface Patination, Visible Surface Deposits And Aging, Aging The The Blade Edge Serrations, Correct Material And Manufacture For The Area Found. This Example Was Made On A Flake By Forming And Notching The Serrated Edges. Found In A Cache In Ceremonial Context Being As Made.